This image is a favourite of mine. I can only try to explain why because I don’t really know for sure. 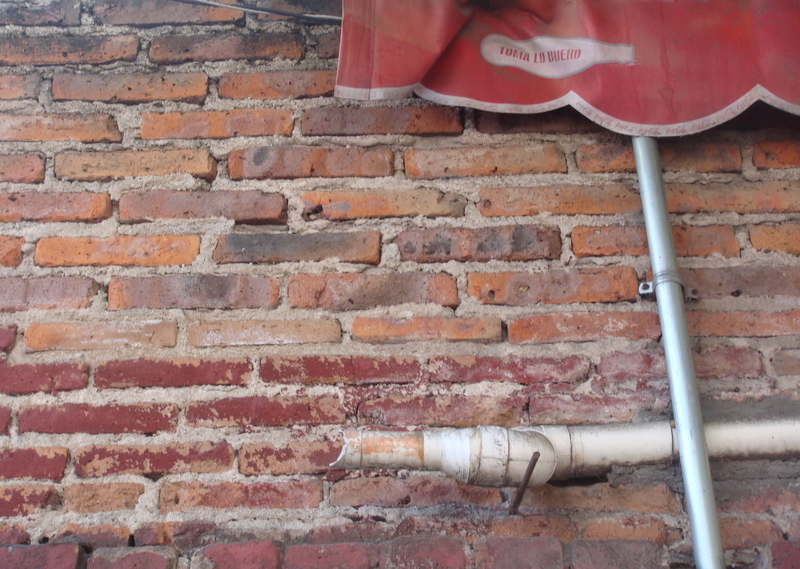 I think it’s the amazing texture and earthiness of the old brick wall. That wall’s been there a while. You can see its history, the repairs and re-builds. I can picture the work that was involved to build it. Hand-made bricks, laid by a team of workers. All done under a hot sun. This wall is of the earth. And, I love the smooth silver pole – a bit of gleam against the earthen work. The line of it cuts across the horizontal lines of brick, which appeals to my eye. And, that other bit of shine – the horizontal piece of pipe, cut off, it seems, before it could be finished. Did they run out of money? Did they run out of supplies? Did a dream get put on hold? And, there’s the fabric awning, a little worse for wear, draped across the top of the image, with its soft, scalloped edge. A contrast to the roughness of the brick and the silvery hardness of the pipes. And, I love the warm tones – orangey-reds and browns. (That’s a technical term – ‘orangey-red’!) I find it grounding. All of the elements seem raw, broken or unfinished, and yet, together, there is some kind of harmony. I find beauty in it – in spite of the wear and tear, or maybe because of it.